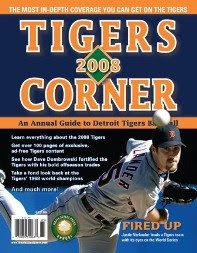 Tigers Corner 2008 will be available at bookstores in Michigan this week. This is the second edition of the book/magazine/annual from Maple Street Press. It is edited by long time analyst Gary Gillette (ESPN.com contributor, Baseball Encyclopedia, etc.). Brian Borawski was the managing editor and also wrote several articles. Several other bloggers including myself, Bill Ferris, Ian Casselberry, Matt Wallace, and Mike McClary also submitted articles. Professional writers contributing to the book include Gillette, Bill Dow, and David Laurila. I received a copy last week and I am very happy with the end result. It covers last season, previews the 2008 season and discusses all of the Tigers top prospects. There is also an extensive section on Tigers history including several articles celebrating the 1968 championship season. The table of contents is available at the Maple Street Press site, as well as ordering information.